.... Big Red has earned, and The Best Spray on Bed liner on the market is what Big Red got! 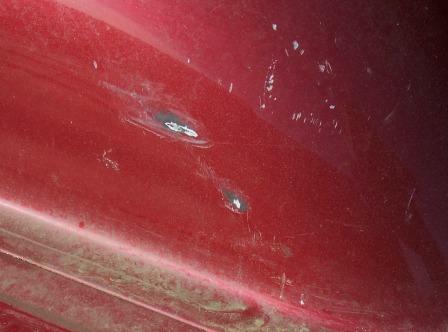 No matter how much you try to be careful, a hard working truck gets a few bumps and bruises. Installing a sprayed liner is a job for improving your tow vehicle that's well worth the money. I looked at all the brands, Bullhide, Line x, Rhino Line, even investigated a DIY yourself bed liner spray. There was something about each that just didn't trip my trigger. A lot of the time, I'm pretty sure, it was a first impression sort of thing. When you're talking about having a bunch of polyurethane sprayed all over your truck, it doesn't give you a lot of confidence, in the available workmanship, when you're standing in what is, basically, a grubby, abandoned, gas station. It gives the perception of a fly-by-night outfit. I want an outfit that produces the impression of quality, that it's going to do a good job, and that it'll still be there in a few months, should there be some sort of difficulty with the spray on bed liner. The guys may be very skilled, but when you're standing amidst a bunch of junk and old grease in the shop, talking about your $45,000 baby, it's hard to see 'em as the outfit you want doing your Spray on Bed liner, with all that crap laying around. Just a word of advice to those doing the work. If you want to attract more business, clean up your act, and your shop! You need to demonstrate a little respect for my expensive property by showing respect for the shop and tools you use! The outfit I chose, Vanworks, in Fort Collins, CO. has the clean setup that gives the confidence I needed. 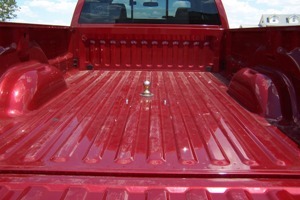 The brand of spray on bedliner they apply is the Reflex Spray on Truck Liner brand. They also do a lot of truck and Van conversion work for local dealers, and have for years, so I had no worries when it came to the workmanship. 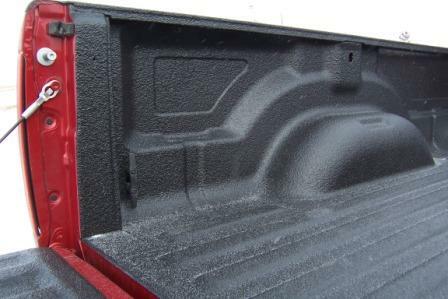 The Reflex brand of Spray on Bedliner is described as "thick, tough and rubbery". It was that "rubbery" part that got my attention. The hardness of the other brands seemed to me, to be, a less flexible formula. Now, I don't want a flimsy, floppy, bedliner, but at the same time I wanted a little more cushion than the others seemed to give. That's just my perception. I could be wrong. Huh? Me? Make a mistake? We all know, that happens very rarely! Like I've said before, I thought I was wrong once, but I quickly discovered I was mistaken! At $525 plus tax for this spray in bed liner, it ain't cheap, but down the road history shows it helps maintain a lot higher "resale value" of the truck. So, eventually, it can pay for itself. Until then, it keeps the truck looking good! Vain as I am, that's a big deal! 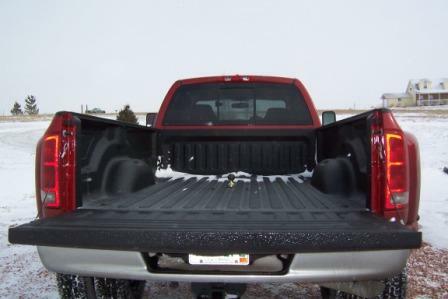 You can get a drop in bedliner for a lot less money, but they have problems. 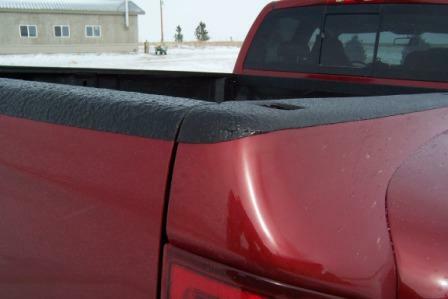 Unlike the spray in bedliners, they trap moisture under the lining and can actually accelerate rusting and bed damage. Then there is the fire / explosion danger they have been found to contribute too. That's right .... fire and explosion! Have you ever seen the static electricity developed by plastic dust collector piping inwoodshops? or the static electricity developed by dry cleaner bags, or vacuum hoses? Same thing. As you roll down the road, the drop in bedliners rub on the body, get rubbed on by the wind, and a fairly big static charge can build up. Then, you go to fuel and .... ZAP! .... you get a big Ol' fat static spark and Whoosh! It's my understanding that the staticproblem was one of the things that pushed the invention of the spray in bedliners. I had Vanworks put my spray on bed liner up over the bed rails to give good protection to that often damaged area. Costs a mite more, but again, pays you back in the end. My original plan was to also have the bottom 6"- 8" of the exterior of the body (rocker panels) covered with spray on bed liner as well. I've seen several trucks done that way, and they look awsome. It protects that portion of the rig from all the road grit and gravel damage it gets hit with. Problem for me was that, at this point, it didn't fit into the budget! It takes a lot of prep work and masking that makes that little bit of spraying cost as much as the whole bed liner. I still want to get it done, sometime, but it'll have to wait until my wallet gains a little weight! There are only two little glitches, very minor, I'll need to detail. Where it is sprayed at the B&W Hitch there are a couple little "tabs" that interfere with the ball, going in and out, that I'll need to clip off with a utility knife. That and he forgot to pull the U-Bolt loops out, where the safety chains clip on. They got sprayed a little. I'll need to cut them loose .... oops! Other than that, I'm real happy with the job. Big Red is happy with his new spray on bed liner .... "So where are my fuel tank and tool boxes?" He wants to know. Geez! For what is supposed to be a machine, he can sure get a little cocky, don't you think? But that's what is coming next! Some of the boxes have been sitting in the shop for a while, waiting on the postponed bed liner. They'll all be getting installed shortly .... as soon as the weather around here warms up a mite!